The exam date of UP Excise Constable had been declared now. 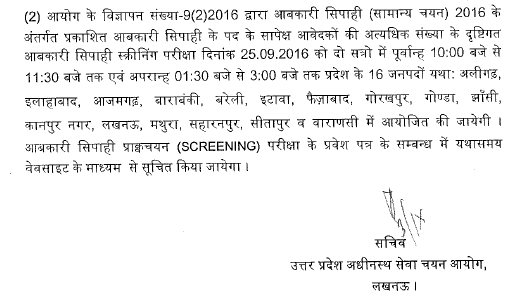 The written examination for the posts of Excise Constable (Aabkari Sipahi / हिंदी : आबकारी सिपाही ) will be held on 25 September 2016 from 10:00 am to 11:30 am and 1:30 pm to 3:00 pm. 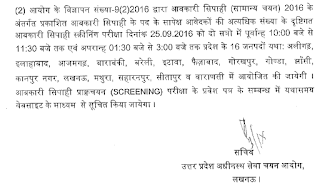 The admit card of UP Excise constable physical test is available from 17 September 2016. 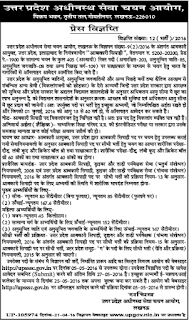 Uttar Pradesh Subordinate Service Selection Commission (UPSSSC) had issued a job notification for filling the vacancies of 405 Excise Constable (Aabkari Sipahi/ आबकारी सिपाही ) posts. Interested and Eligible candidates can apply online from 05-05-2016 to 27-05-2016 at upsssc.gov.in. Other details like Eligibility criteria, selection procedure, fee are given below. 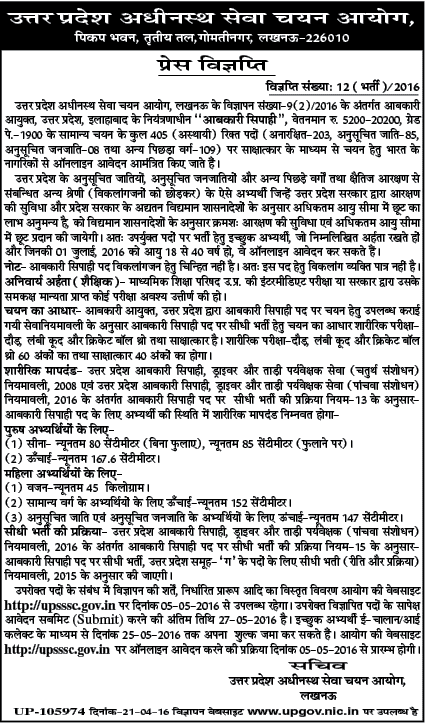 Uttar Pradesh Subordinate Service Selection Commission had published the Notification no. 12(rectt) / 2016 inviting applications from eligible candidates to the temporary posts of Excise Constable. Educational Qualification: Candidates should have passed 12th/ inter from a recognized school / college. Selection Process: Candidates will be selected based on their performance in physical test and interview. Physical test will carry 60 marks while interview will be of 40 marks. Rs. 65/- for SC/ ST Candidates. Eligible candidates can apply online through the website upsssc.gov.in from 05-05-2016 to 27-05-2016. Starting Date to Apply Online: 05-05-2016. For more details, check the UPSSSC Excise Constable notification from below.